As seen in "MythBusters: Ancient Death Ray"
Explanation: It's probably no surprise that the same chemical compound called thiols that's found in skunks' noxious spray is also present in rotting flesh and feces. And what better team to tackle those malodorous molecules than MythBusters Jamie Hyneman and Adam Savage? To start, after coaxing three separate skunks to spray, the pair finally got one to release its torrent of thiols. Then they scoured their skunk-soaked clothes and bathroom in a variety of home remedies, followed by a sniff test to determine whether each potential solution was confirmed, busted or plausible. 1) Beer — busted. Still skunky and not like bad beer. 2) Tomato paste — plausible. Eau de skunk still snuck through the acidic sauce. 3) Feminine hygiene product — busted. Douche doesn't double as a skunk scrub. 4) Commercial skunk-scent remover — plausible. Orangey with a hint of skunk. 5) Hydrogen peroxide, baking soda and dish soap — confirmed. From skunky stench to squeaky clean. Why did hydrogen peroxide work? 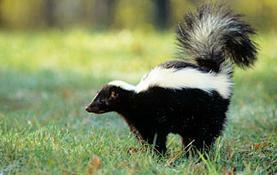 The oxygen molecules in the soapy solution neutralized the skunk scent by bonding to those terrible thiols. By altering that chemical makeup, this stink-fighting antidote made the smell quickly disappear. With this confirmed skunk home remedy, the MythBusters proved it might actually be harder to entice the animal to spray on command than get rid of its stench!